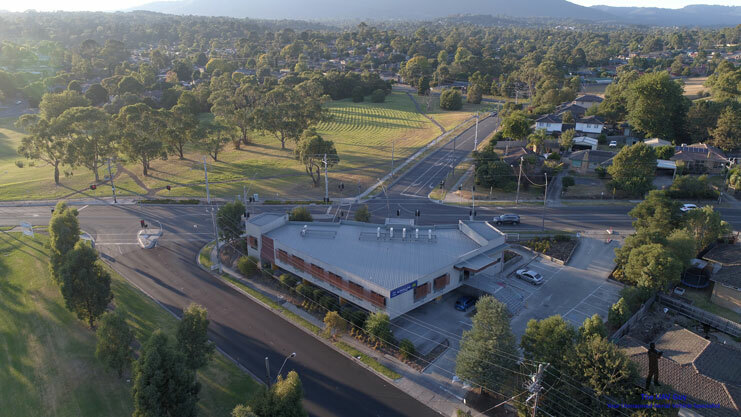 Situated at one end of the Brice Avenue shops, surrounded by Red Earth Park, the Mooroolbark Community Centre is dedicated to bringing people together through a range of arts and cultural activities, including visual and performing arts events, workshops and exhibitions. A beautiful feature of Mooroolbark’s town centre, Hookey Park consists of native gardens, walking paths, shady trees, a state of the art Adventure Playground, the ANZAC Memorial Garden and Rotunda. Hookey Park is a popular community gathering place and hosts the ANZAC Day service and Carols by Candlelight event presented by the Lions Club of Mooroolbark. Enquiries can be made to Yarra Ranges Council for more information about booking an area of the park for special occasions. Mooroolbark Library occupies a spacious building with large windows overlooking Hookey Park. Opened in July 1984, it is very close to the Mooroolbark Station and shopping centre. The library is a community focal point and boasts a large children’s section. – External: Accessible, gender-neutral toilets adjoining Mooroolbark Library which are accessible from outside the library. – Internal: 1 gender-neutral ambulant toilet, 1 gender-neutral accessible toilet with baby change facilities. Wheelchair and pram access from the carpark via a ramp to two sets of automatic doors. The library is on one level. Accessibility for wheelchairs and prams is good. Catalogues are on high tables. 25 Angle restricted parking spaces (2-hour parking) on the same side of the road as the library and 12 parallel restricted (2-hour) parking spaces on the opposite side of the road. Restrictions operate 9am-6pm Monday – Friday and 9am-12noon Saturday. After hours book return chute available. The Mooroolbark and District Miniature Railway and Steam Club Incorporated was established in 1980 in the outer eastern suburb of Mooroolbark, Melbourne, Victoria, Australia. The dedicated volunteers now run train rains on the 4th Sunday of each month 11am to 4pm, except in December. Rides are $2.50 per person and they are a cash-only facility. Make sure you wear enclosed shoes! Photo from the Miniature Railway Facebook Page.